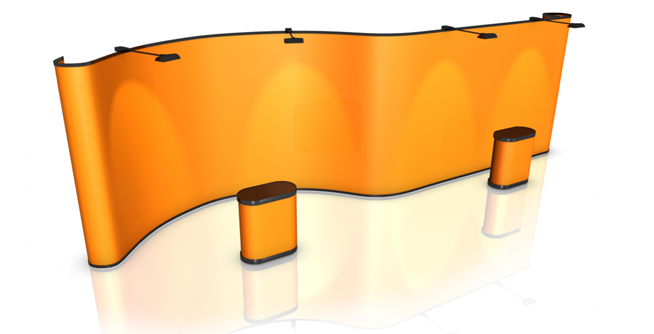 Bare tabletops don’t look so attractive in exhibition booths. 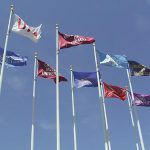 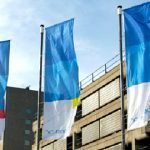 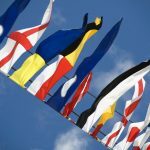 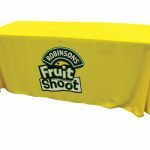 While putting a tablecloth easily solves this decorating problem, why not maximise your display by using printed tablecloths for trade shows with your company logo on it? 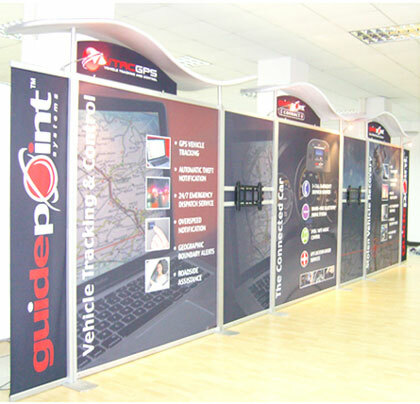 It will show your audience at a glance who is occupying your booth, as well as give them an idea of what products and services you deliver. 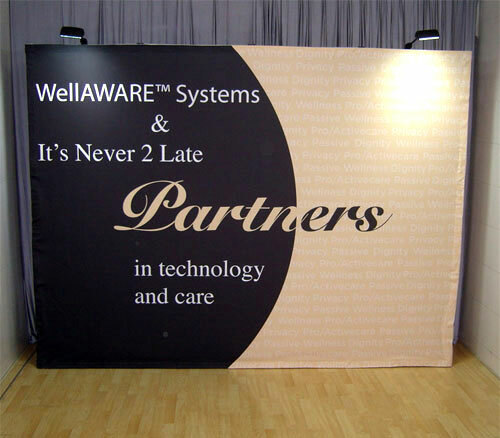 We offer you our 6ft logo table cloth for this purpose. 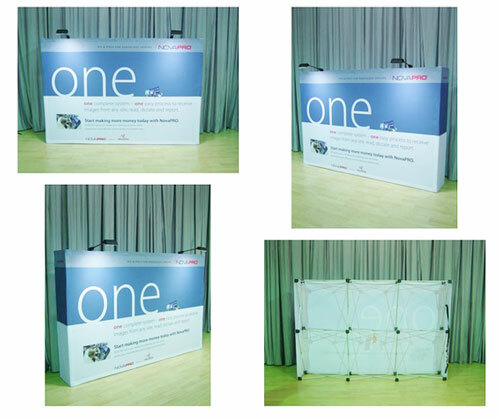 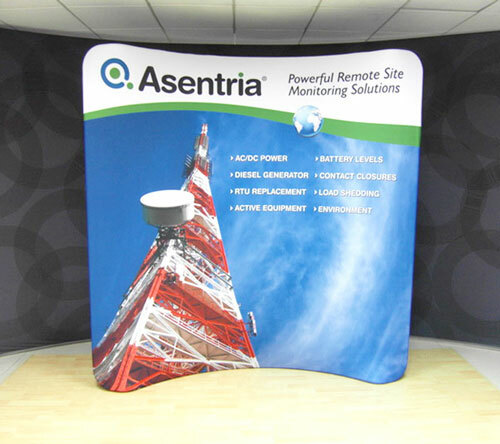 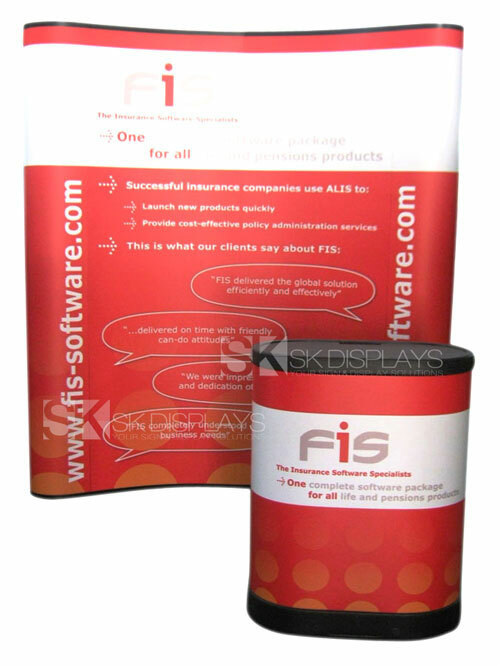 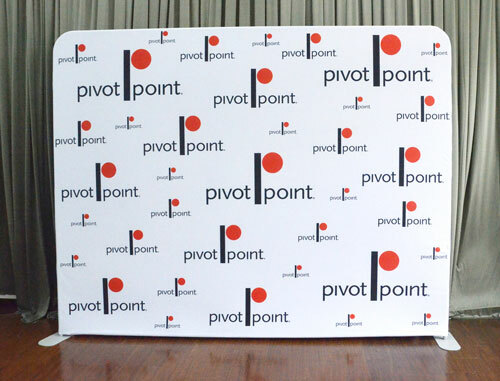 Our 6ft corporate logo printed tablecloth will help make your exhibition stand bright and attractive. 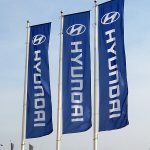 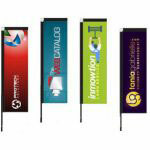 More than that, it is also a great identifier and advertising tool for your company. 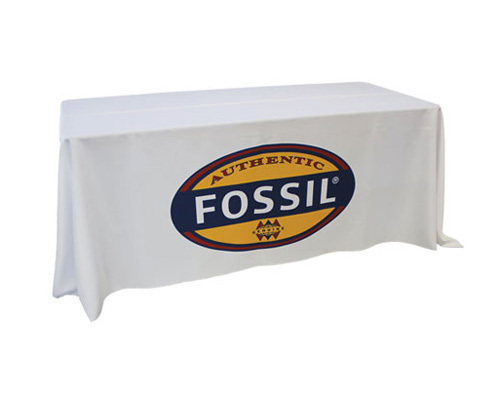 This particular cloth we offer fits a six-foot table. 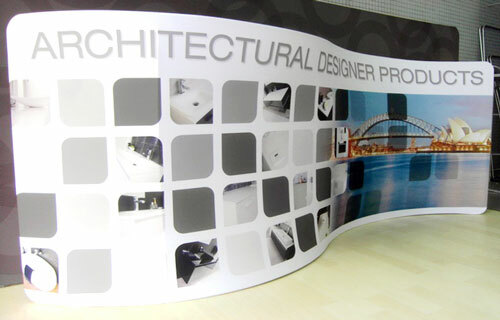 It has a fabric thickness of 210gsm, which makes it thicker than most tabletop cloths of its kind available in the market today. 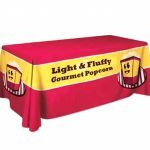 This table cloth is usually four-sided, but you can opt for a three-sided or “open back” tabletop cloth. 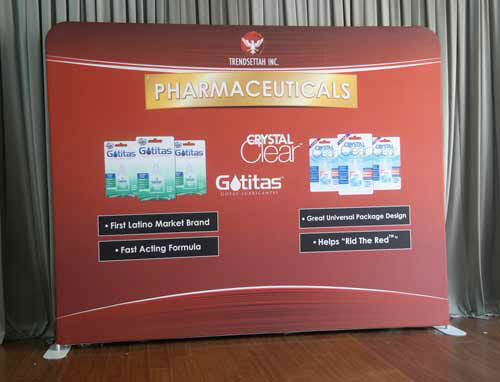 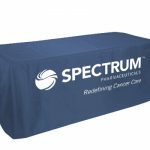 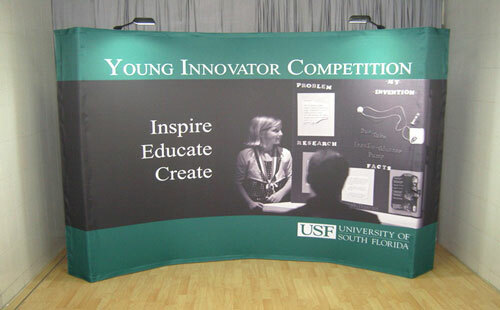 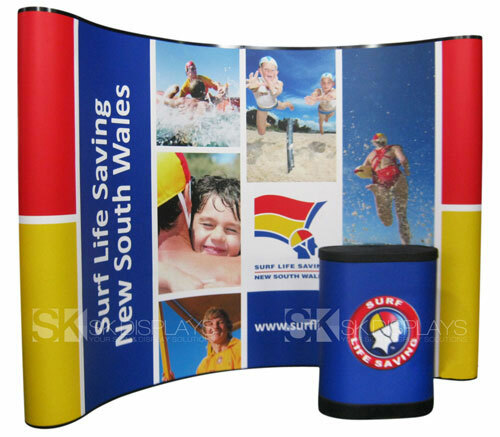 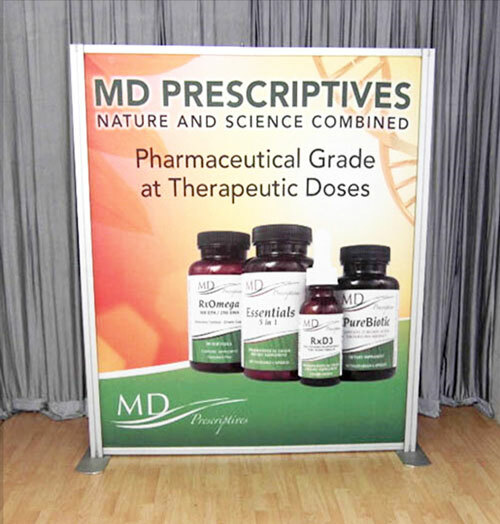 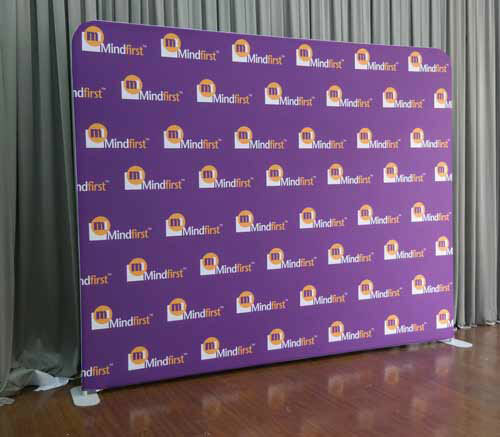 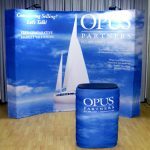 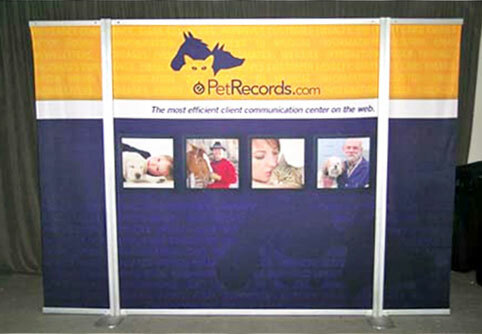 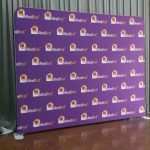 Our 6ft table cloth is guaranteed to brighten your booth and make your logo pop out at your audience. 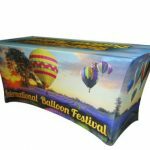 That’s because we use dye sublimation printing in producing them. 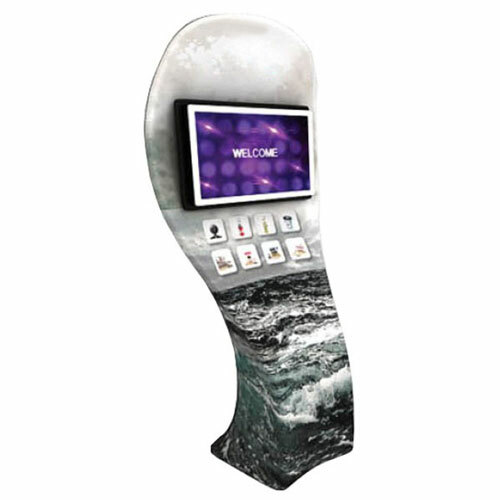 Dye sublimation is the most colour-precise printing technology available today. 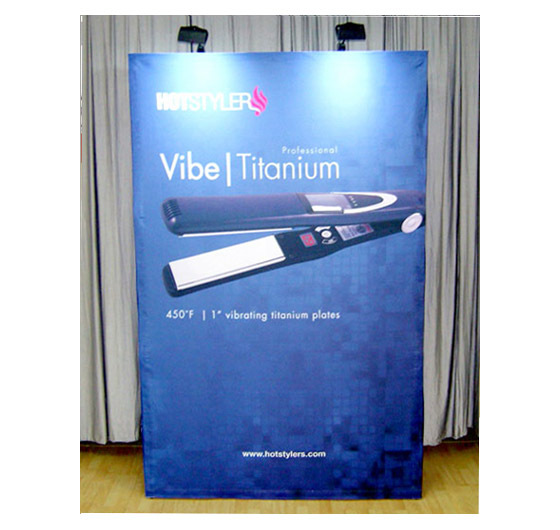 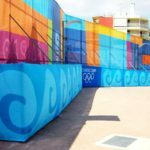 In dye sublimation printing, the desired image is first created digitally, and its mirror image is then printed on special heat-resistant transfer paper. 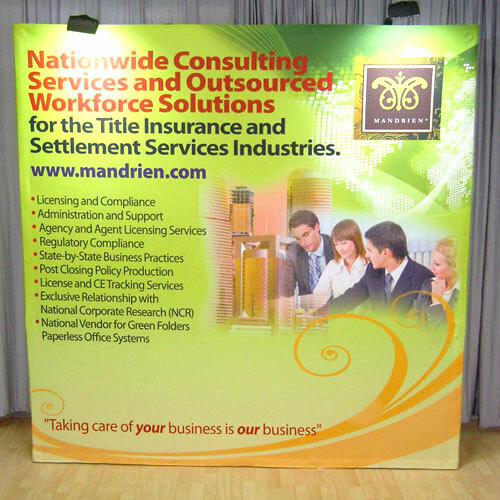 The printout is then pressed onto the fabric of the tabletop cloth using pressure and very high heat. 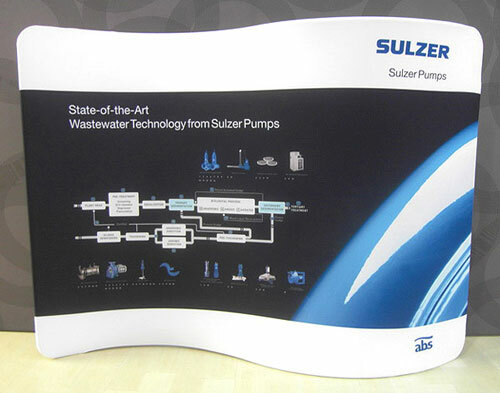 The heat and the pressure cause the ink on the printout to transform into gas, completely bypassing the liquid state, and permeate the threads of the fabric. 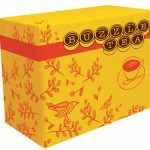 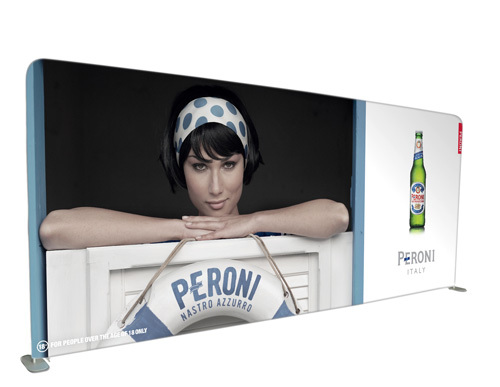 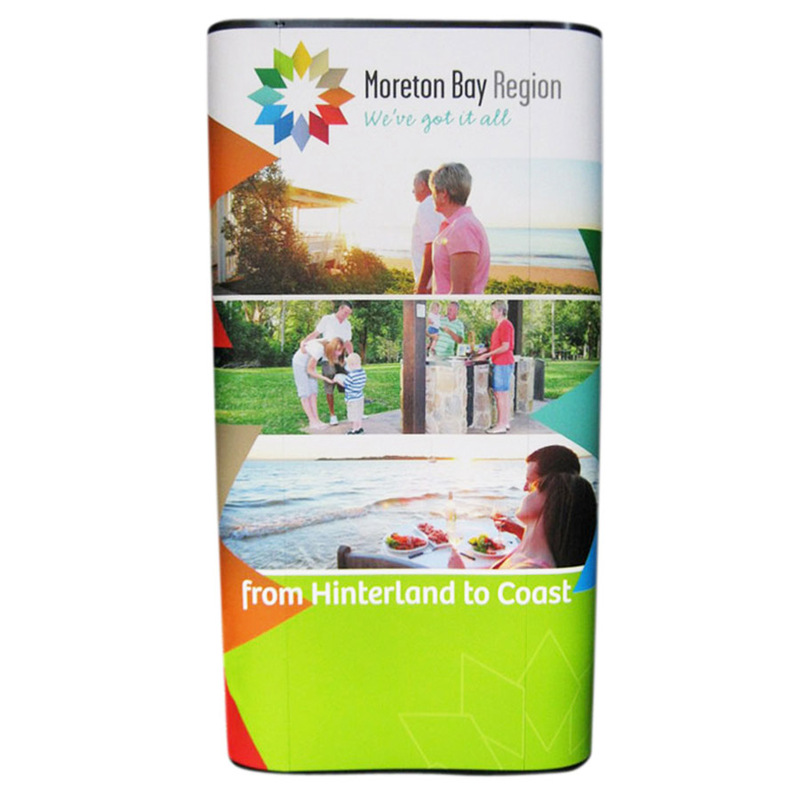 Dye sublimation printing results in accurate, photo-quality images with vivid, realistic colours. 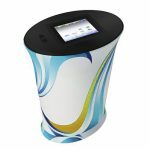 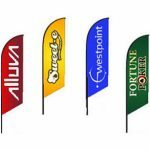 Your corporate logo will truly come alive when printed out using this technology. 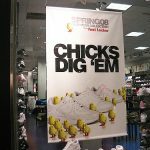 Moreover, as the ink has become infused into the threads of the fabric itself, the printed image will lay flat on the fabric. 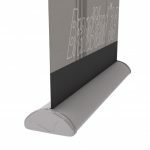 You won’t feel any ridges or contours on the printout. 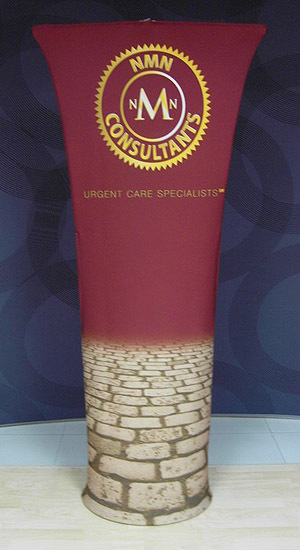 Additionally, the printout automatically comes out in full colour. 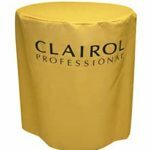 So, the price you pay when you buy our table cloths will stay the same regardless of the number of colours used in the printing process. 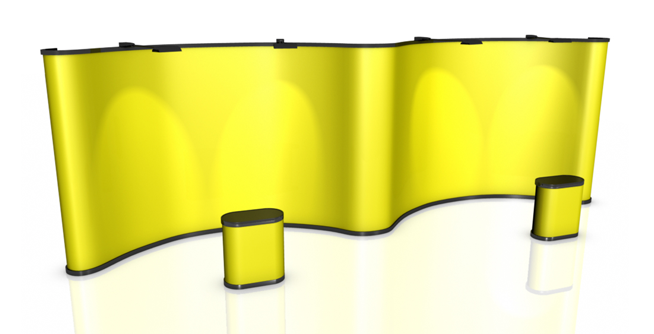 You can also pick out the colours you wish to use from the Pantone colour library, which is an index of different shades of different colours. 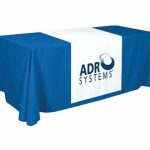 For example, if you want to have a blue table cover, you get to select the specific shade of blue you want – ice blue, sky blue, midnight blue, navy blue, azure, turquoise, cerulean, etc. 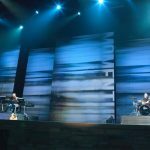 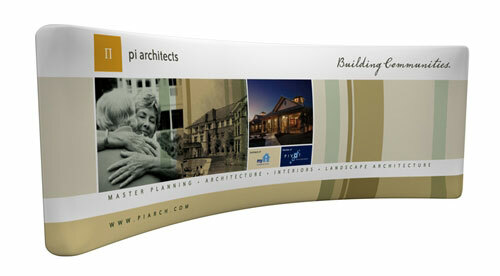 You can either provide us with the layout of the design you want, or we can do the layout for you. 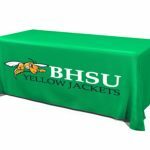 We will test print the image first before coming up with the final product so the printout on the table cloth will come out exactly as you want it. 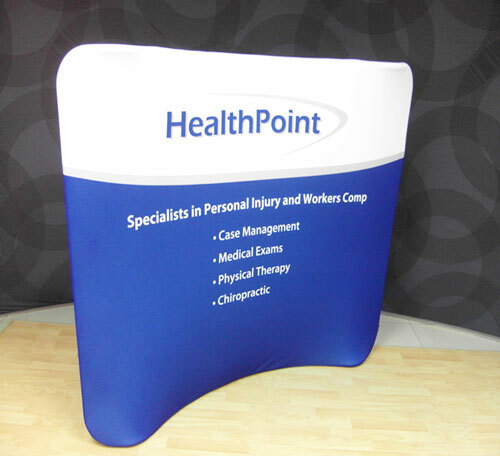 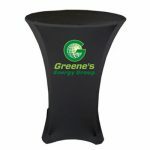 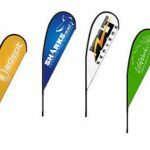 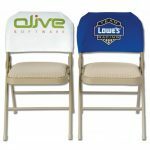 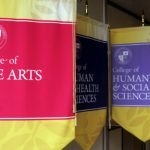 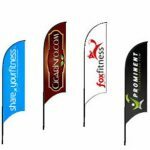 These logo tabletop cloth printouts we offer are practical. 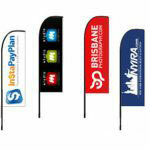 You can reuse it as often and as many times as you want without worrying about your logo fading. 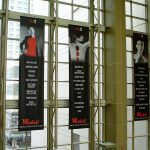 As mentioned earlier, the ink in dye sublimation printing permeates the threads of the fabric itself. 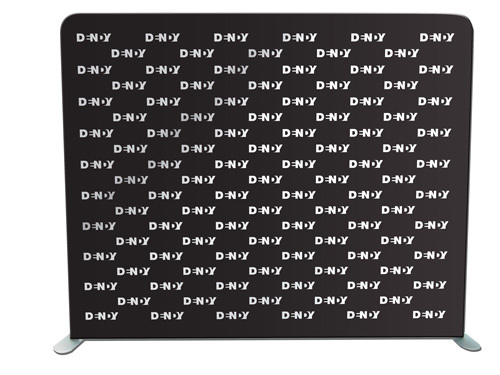 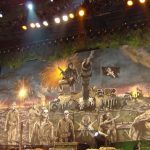 Thus, the image becomes permanent on the fabric. 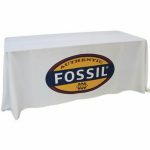 It will not crack or fade, so you can have it washed or dry-cleaned without any worries. 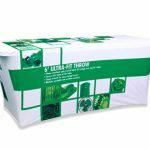 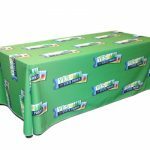 And because dye sublimation printing is a simple and straightforward process, we don’t require a minimum number of printed table cloths when you order from us. 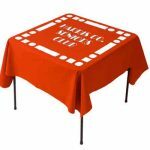 You can buy just one if you only need one table cloth. 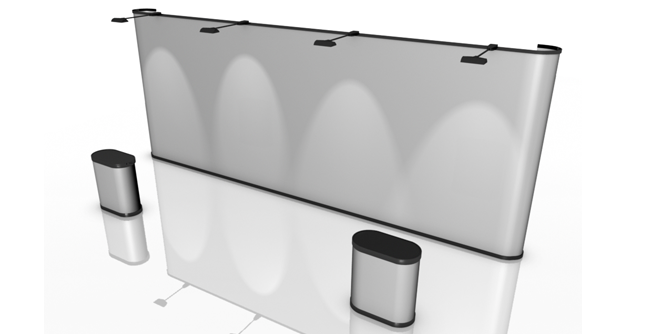 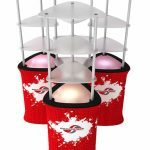 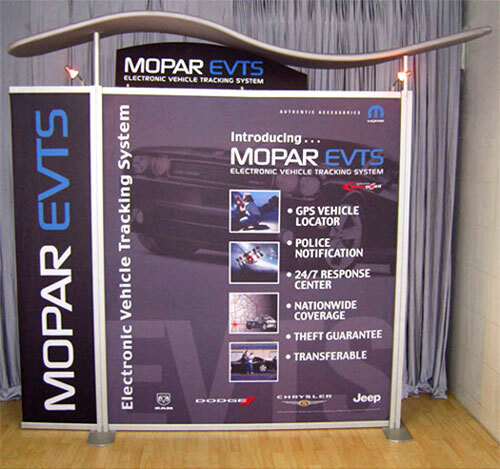 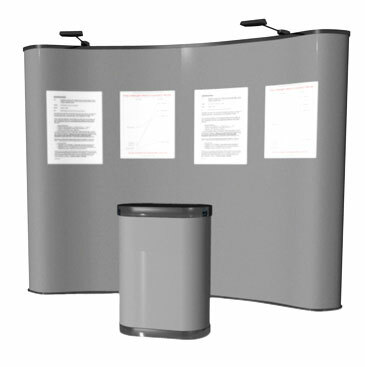 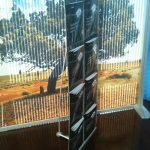 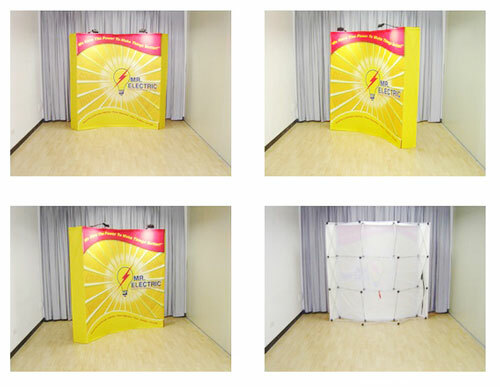 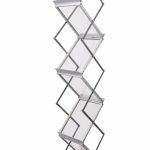 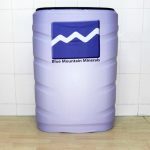 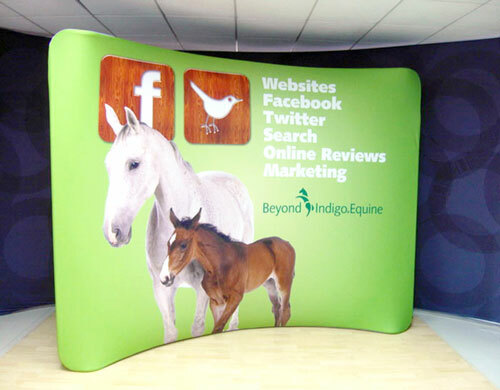 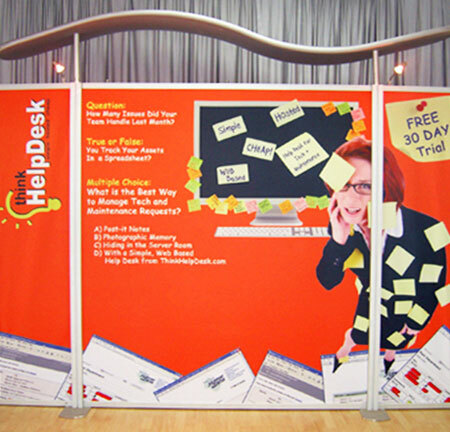 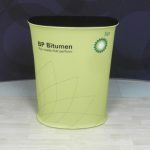 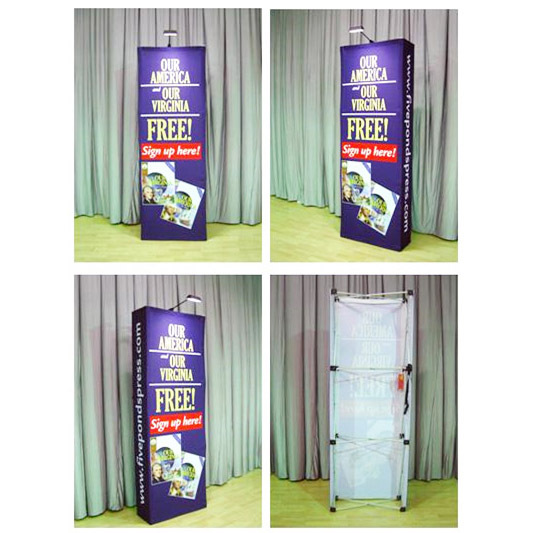 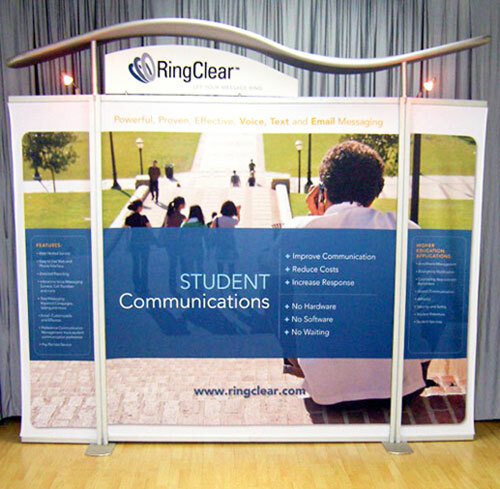 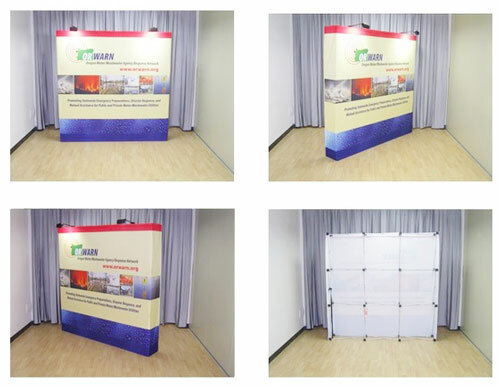 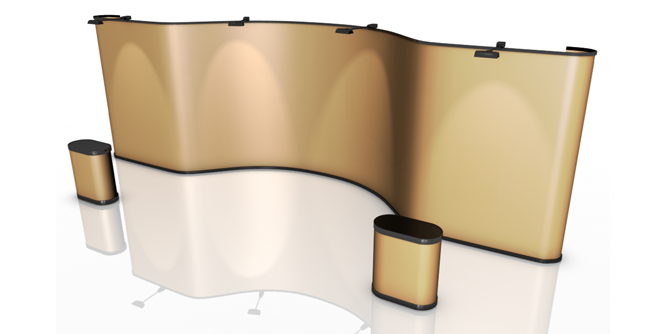 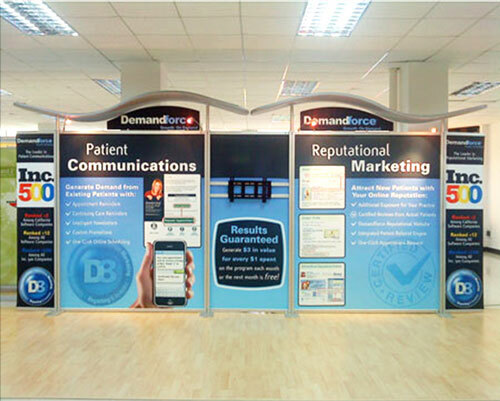 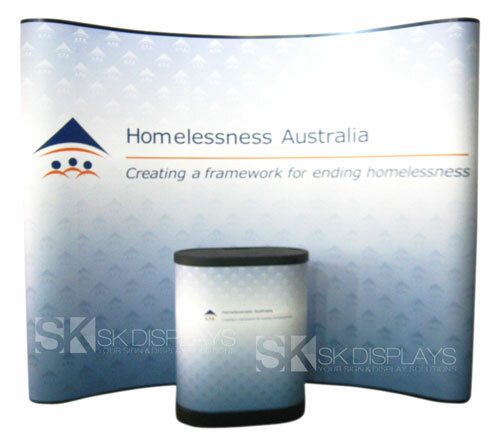 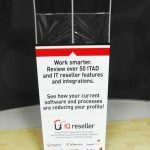 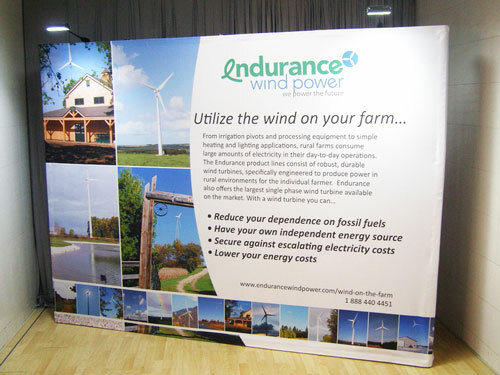 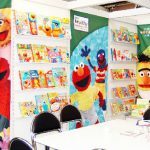 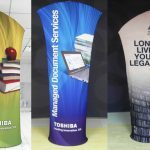 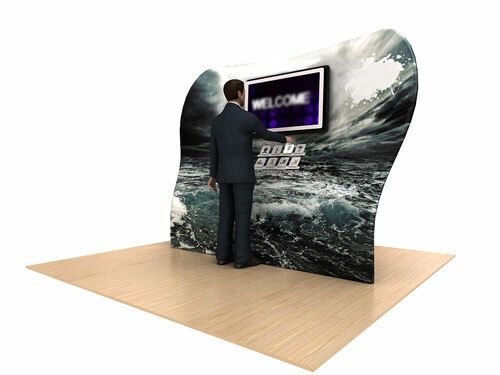 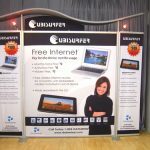 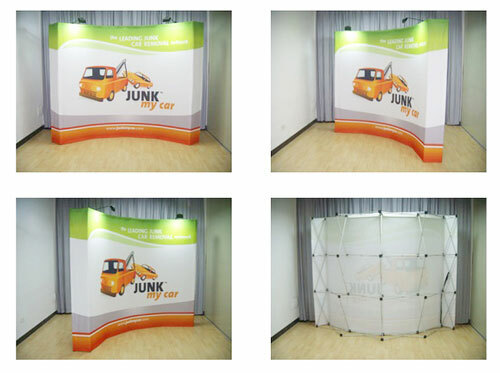 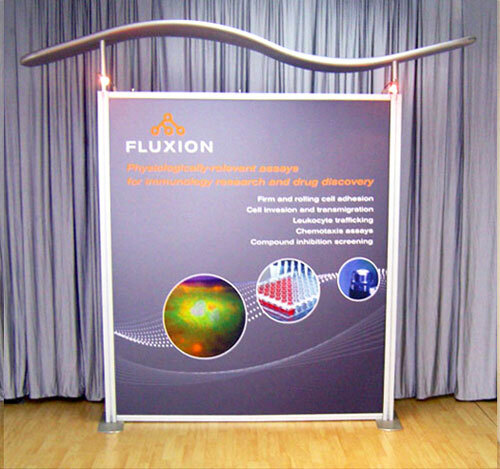 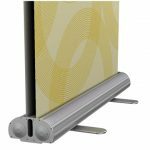 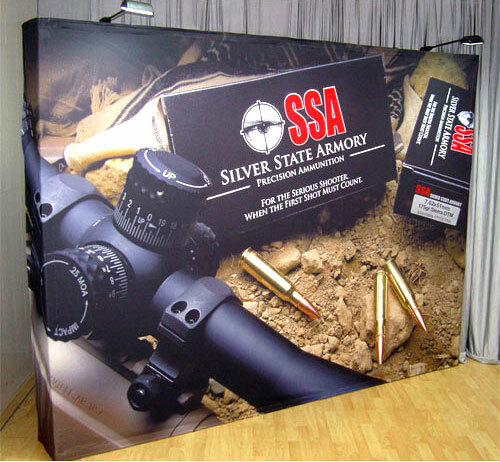 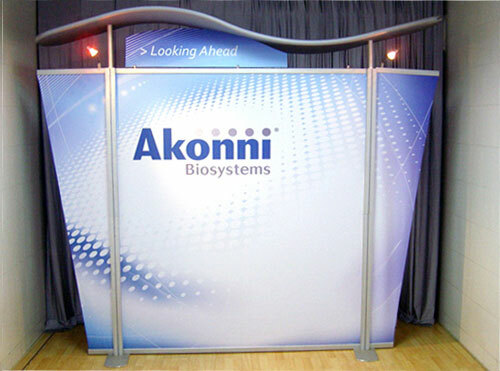 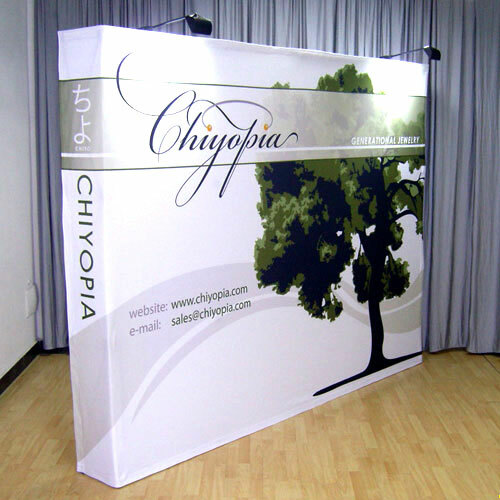 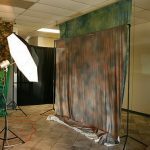 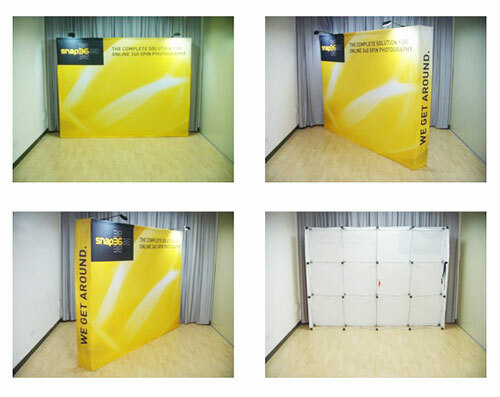 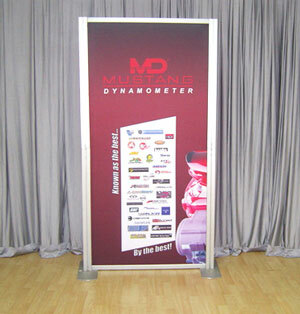 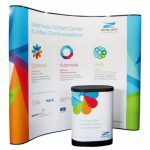 It is the most affordable option you will find if you are looking into saving money on decorating your exhibition stand. 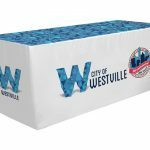 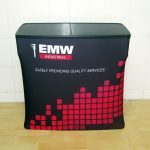 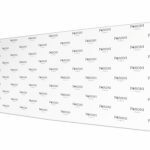 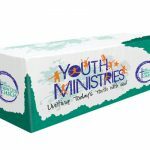 Our 6ft logo table cloth is truly the best and most practical choice you have when it comes to maximising the limited space of your booth at a trade show or expo. 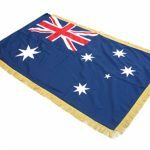 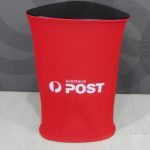 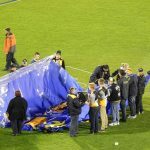 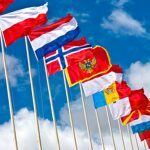 We deliver to any location in Australia, including Sydney, Melbourne, Canberra, Adelaide, Gold Coast, Brisbane, Perth and Darwin. 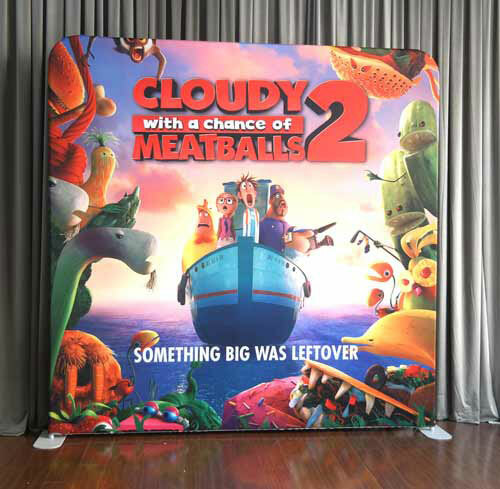 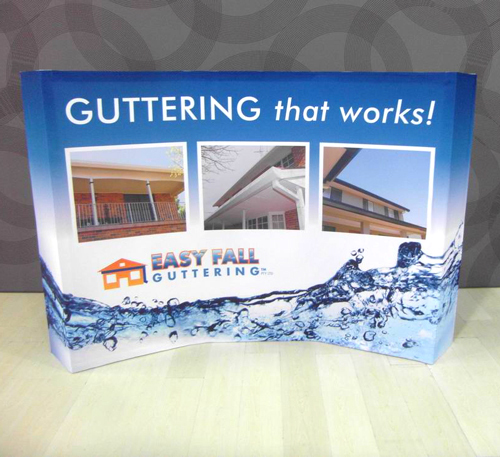 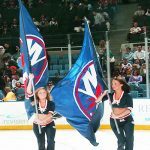 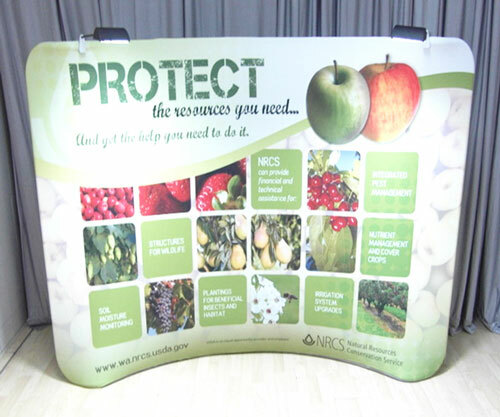 Call us right now for more information on how we can assist you with these printed tablecloths for trade shows.